This fully irrigated Adirondack Mountain course was established in 1896 and is one of America's oldest golf courses. 9-holes are surrounded by beautiful pines and scenic mountain views. On-site are a restaurant and pro shop. Established in the 1920's, this 9 hole golf course is fun and challenging at an affordable price. Tee Times accepted on weekends. Practice Range, Driving Range, Pro Shop, Restaurant and Cocktail Lounge also available. Tupper Lake Country Club is home to a beautiful 18-hole golf course designed by Donald Ross. An event space called The 19th Hole is perfect for wedding receptions. This 9-hole golf course is a typical Adirondack course featuring scenic fairways and manicured greens. The course is par 36 and is great for golfers of all skill levels. 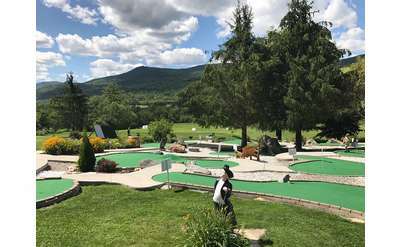 Located in the Southern Adirondacks, Green Mansions Golf Club features nine challenging holes, plus a driving range and pro shop. Looking for added excitement? Try one of their night time golf outings by flashlight! This 18-hole course has 4 sets of tees to welcome players of all levels A classic Scottish design by Seymour Dunn, this club is both beautiful and challenging. Continental breakfast is available when you book Golf & Stay packages. Family owned and operated 9-hole golf course designed by Seymour Dunn. Walk ons welcome! 9-hole golf course that follows along the flowing Cedar River backed with beautiful Adirondack views. Stay and play at the on-site motel or stop in for lunch at their restaurant. Only one mile from the town of Indian Lake. This is an 18-hole championship golf course with a practice range, putting green, lounge, and banquet facilities. At America's third oldest golf course, enjoy an 18-hole championship course and even stay and play at on-site lodging. A unique 18-hole course in Lord Howe Valley on the north end of Lake George. Players of all skill levels are welcome at this public course.